Europe’s biggest problem is that it solely relies on economic levers when it deals with the migration. Almost a million migrants have arrived in the European Union this year, becoming a new factor in the political life of the recipient countries and causing contradictions between individual EU member states. Most migrants have arrived from the war-torn Syria, followed by Afghanistan, Kosovo, Iraq, Albania, and Pakistan, according to Eurostat. 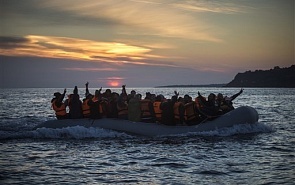 In a comment for valdaiclub.com, Andreas Andrianopoulos, Director of the Institute of Diplomacy and Global Affairs, American College of Greece, highlighted the dangers flowing from the Western reaction to the surge in refugees from the Middle East. “Why did the flow of refugees from the war zones toward the West take such great proportions in recent months?” Andrianopoulos asks. According to him, this may be related to a statement of the ISIS leader who said last February that the terrorist organizations’ goal was to “flood the West with migrants till we will dominate in these societies from within”. The Greek scholar illustrates his concerns by an interview he held in Baku as part of his coming book on Azerbaijan. “You must understand a few fundamental Islamic principles, which no Muslim devout to the traditions can repudiate, wherever he is,” his Azeri interlocutor said. “According to the Qur’an and many ‘Hadith’ (acts and interpretations of the application of the rules) it is a sacred duty for every believer to relocate to places around the globe which, in whole or in part, are not controlled by Islam. Based on the instructions of ‘Da’oua,’ which consist in a kind of Islamic requirement, all of them have to work to spread the message of Islam and the establishment of an Islamic state,” he added. “Unfortunately, the West has its eyes shut. By responding with reason and with its liberal humanism, the West signs its own death sentence. The atrocities in Paris constitute only the start of a series of such heinous acts,” Andrianopoulos warned. Europe’s biggest problem is that it solely relies on economic levers when it deals with the migration, Andrianopoulos said. “Europe continues to believe it will solve all of its problems by buying its way out of any crisis. With this logic and mentality it did nothing after the massacres in Madrid, London and previous criminal activities in Paris. Filling with Muslims, all of whom deeply believe in the future dominance of Islam, independently of the manner they are received, the question of internal subversion continues to exist,” he added. “Diplomatically Greece should demand from our partners and NATO the requirement of our allied countries to cut all aid and economic relationship with countries that either do not accept return of the migrants to their territories (for instance in Pakistan, Bangladesh, Somalia, Eritrea, etc.) or cessation of any (mainly economic) relationship with countries that support the extremists (Qatar, Saudi Arabia, Emirates),” Andrianopoulos concluded.